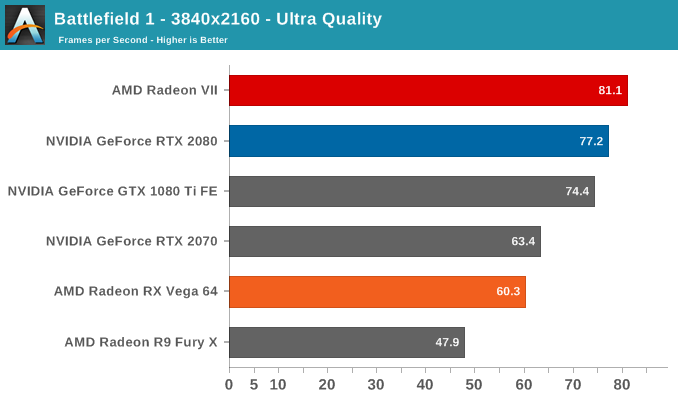 The first reviews for the 7 nm AMD Radeon VII GPU are out and they all seem to give an impression that AMD has managed to take the fight to the RTX 2080's pavilion. 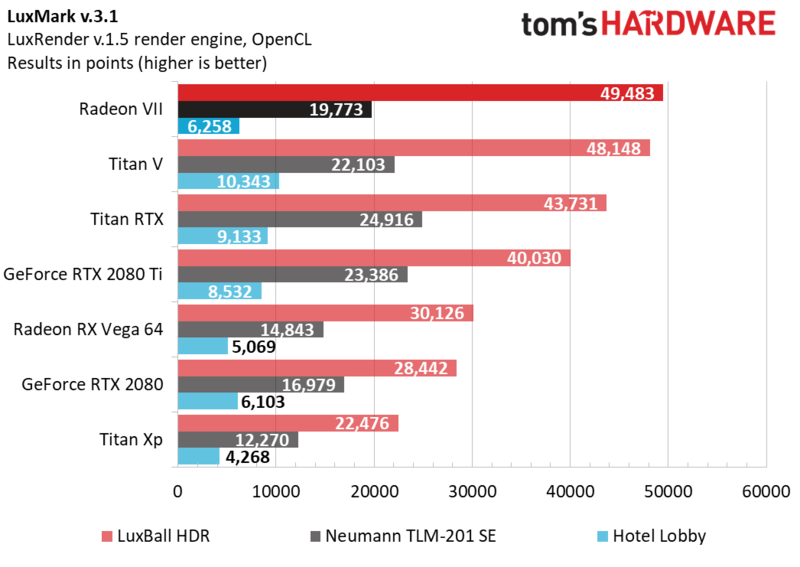 With a whopping 16 GB of HBM2 VRAM and a 1 TB/s memory bandwidth, the Radeon VII seems to focus more on raw power and compute performance versus niceties such as ray tracing or AI supersampling. Is the added power enough to move past the RTX 2080? The initial reviews seem to say, not just yet. 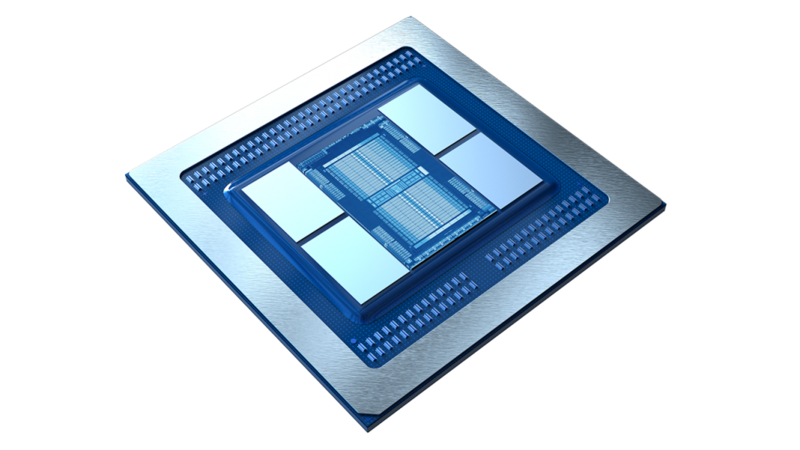 The Radeon VII, first showed off during CES 2019, is AMD's attempt to bring 7 nm goodness to the consumer market. The Radeon VII is based on the same Vega 20 core as the professional Radeon Instinct MI50 and MI60 cards. In more ways than one, the Radeon VII has the potential to eat into the Radeon Instinct's sales thus requiring AMD to cut back on some prosumer features such as ECC memory support, RAS support, Infinity Fabric Links, reduction in NCU count to 60, and lack of PCI-Express 4.0 support. AMD is marketing the Radeon VII as a gaming card first and foremost and initial reviews are giving us the impression that the new Vega 20 is within a 5% performance deficit of the RTX 2080 in most gaming benchmarks. Here's how the Radeon VII stacks up in comparison to other cards in AMD's lineup. 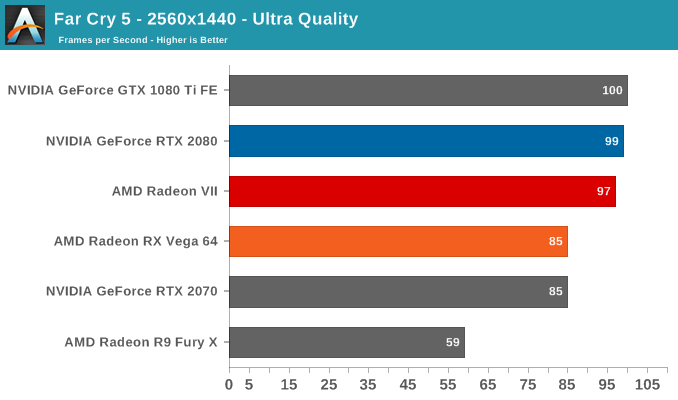 According to Anandtech's tests, In Battlefield 1, the Radeon VII seems to have good leads over the RTX 2080 at both 1440p and 4K ultra settings. 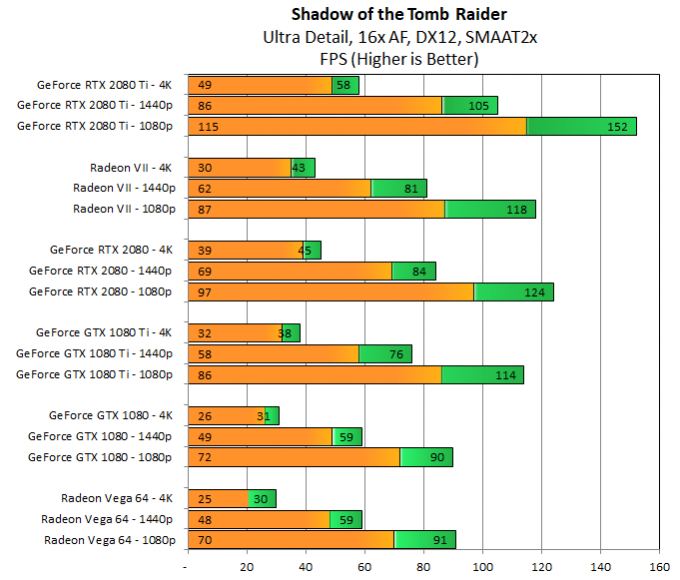 However, in AMD-optimized titles such as Far Cry 5, there doesn't seem to be much of a palpable difference between the Radeon VII and the RTX 2080 in 4K Ultra and we start seeing downward trends at lower resolutions. A similar performance is seen in Ashes of the Singularity: Escalation and Wolfenstein II: The New Colossus as well. While Ashes: Escalation did seem to perform less smoother on the Radeon VII, the disparity between average and 99th-percentile frame times was minimal in Far Cry 5, leading to an overall smoother experience, according to PC Perspective's tests. 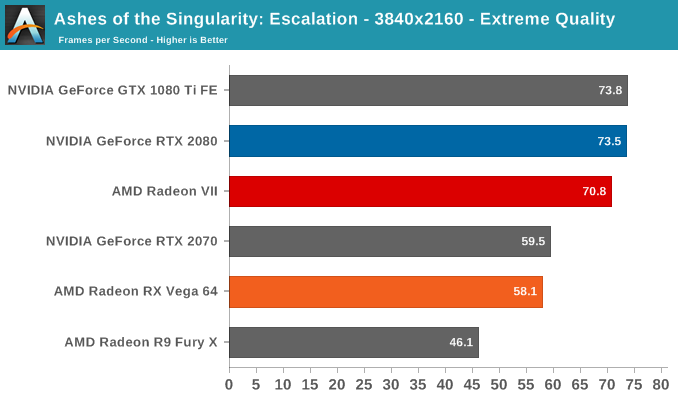 In Extremetech's benchmarks, the Radeon VII seemed to show ~1.32x better performance than the Vega 64 but was more or less tied with the RTX 2080 in most games. 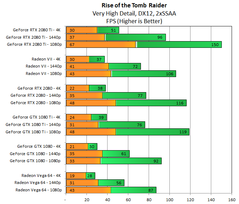 In Rise of the Tomb Raider, for example, the RTX 2080 and Radeon VII performed similarly at 4K Very High while the performance gap starts getting wider as one dials down the resolution. 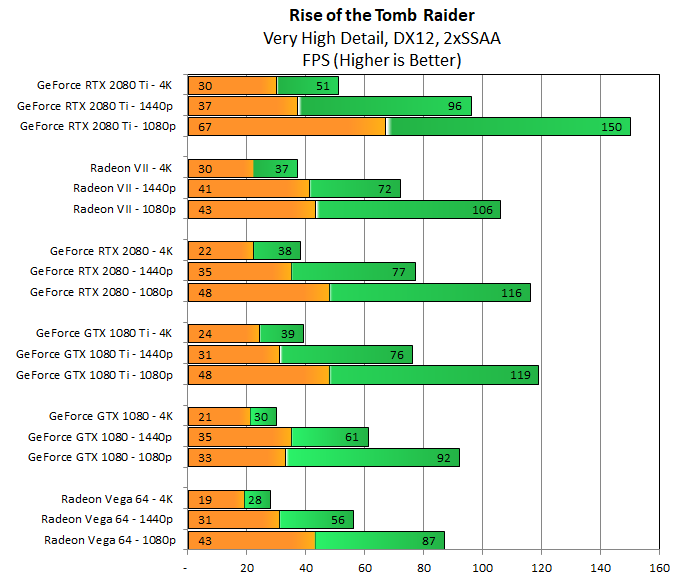 A similar trend was seen in Shadow of the Tomb Raider as well with significant gains over the Vega 64 and slightly trailing behind the RTX 2080. 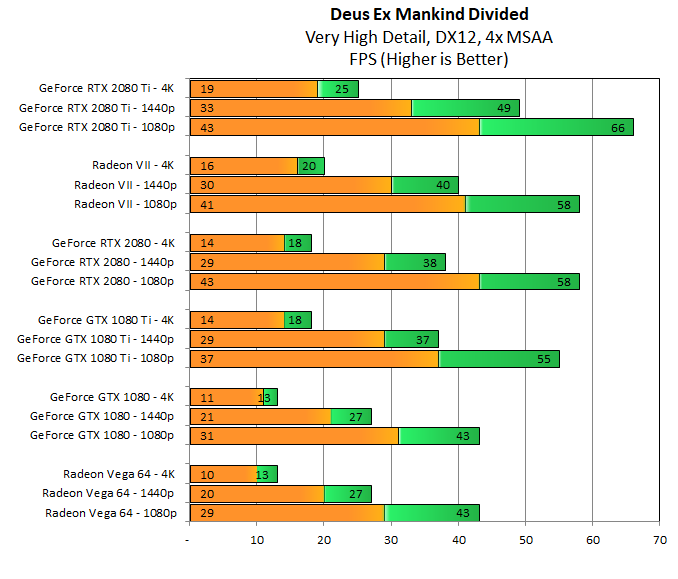 Performance in Deus Ex Mankind Divided was surprisingly good with leads over the RTX 2080 in both 4K and 1440p and almost closing in on the RTX 2080 Ti at those resolutions. The Radeon VII's large memory and increased bandwidth should no doubt be advantageous in compute workloads and we see expected performance gains in such benchmarks. After all, this is a server-grade Radeon Instinct at heart. 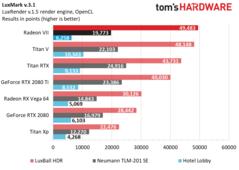 According to Tom's Hardware's compute tests, the Radeon VII manages to displace even the Titan V in the LuxMark HDR test while it does trail behind the RTX 2080 Ti in Neumann TLM-201 SE and Hotel Lobby tests of the LuxMark suite. 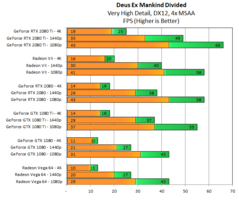 Significant benefits can be seen compared to the RTX 2080 in SPECviewperf 13. 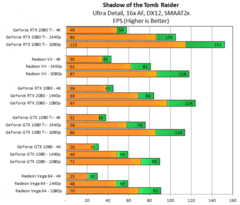 GPU-only performance in Blender was an improvement over the Vega 64 while it did seem to trail behind the RTX 2080. 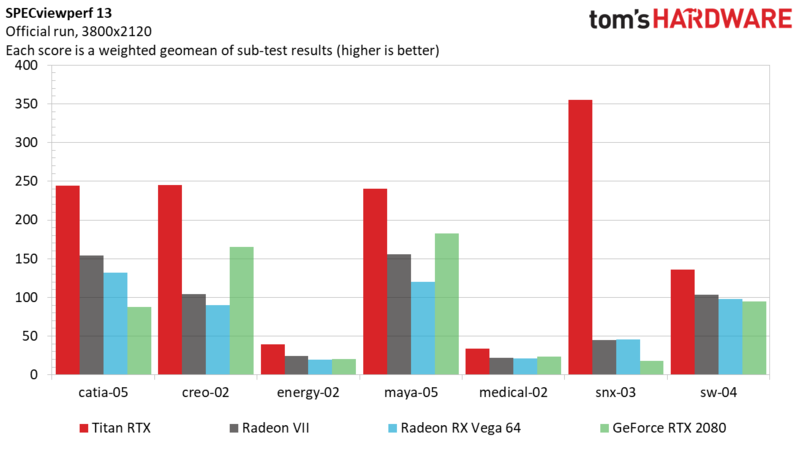 In Anandtech's CompuBench 2.0 tests, the Radeon VII managed to ace the RTX 2080 and the Vega 64 in every sub-test. 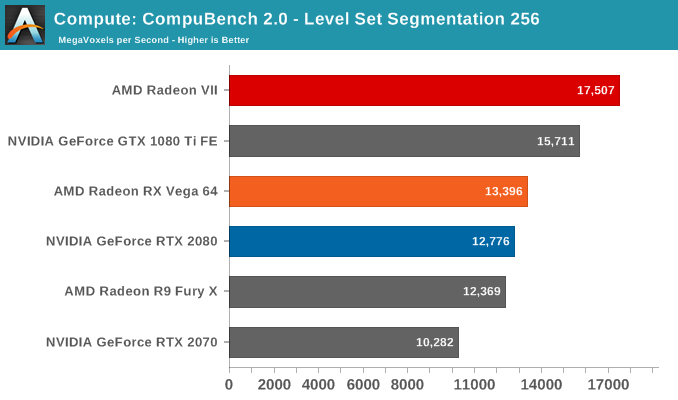 Overall, it looks like the AMD Radeon VII leads in few benchmarks while lagging behind in others when compared with the RTX 2080. Of course, we might see better performance figures as drivers mature and become more stable. It is the fastest GPU in the Radeon lineup but still needs extra momentum to really displace the RTX 2080 when it comes to gaming. We don't see ray tracing or DXR support yet, but that can be forgiven given that not many games have actually implemented it without severe performance penalties. The high memory bandwidth should be of immense benefit to content creators and compute-intensive workflows, and these sectors could lap up a significant proportion of these cards. While performance-per-Watt seems to have been improved in the Radeon VII compared to the Vega 64, the new GPU doesn't come across as a very power-efficient chip despite the move to 7 nm. However, one should also factor in the increased boost clocks (1,800 MHz) and the amount of HBM2 memory onboard before deducting points. In Vega 20, AMD is also transitioning to Junction Temperature readings across the entire die instead of relying on the edge-mounted thermistors. This might lead to higher temperature readings, but AMD says that's perfectly alright. Another important factor to consider is the price. At an MSRP of US$699, there is not much incentive at the moment to choose the Radeon VII over the RTX 2080. Notwithstanding the free game bundle valued at US$180, a price drop by about US$100 could definitely turn the tide in AMD's favor. We look forward to testing the AMD Radeon VII ourselves in the days to come, so stay tuned.